Time as memory, as history, as the labour of acquiring skill and making and as simple material persistence inheres in all things and particularly so in the crafted object where the residues of culture, individual history, habit and the strictures of each medium are synthesised into these articulate objects. 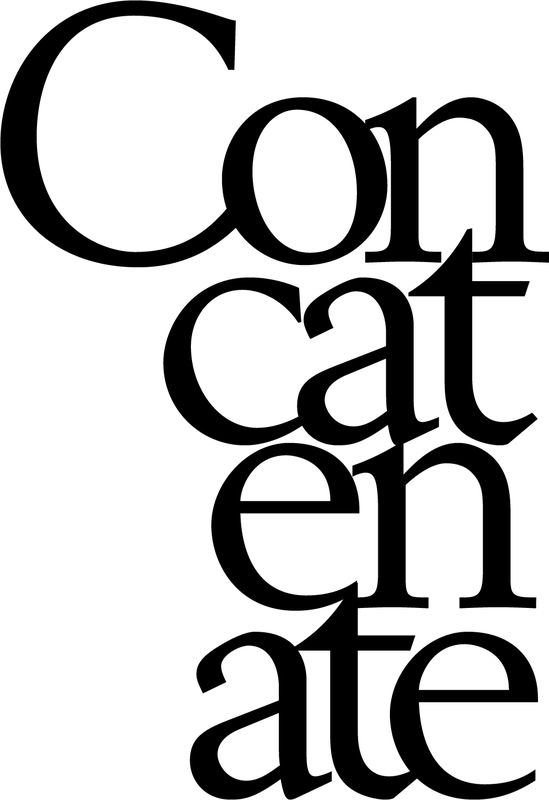 It seems that with this sinking of time into making goes a particular kind of attentiveness, not as pernickety detail but as a consideration of the thing and of the process itself happening in time. It is this attentiveness to time in all its forms, as history, residue, custom and ritual that enables the works inResonance to emerge from their own traditions and work deftly between other forms and disciplines setting up echoes and connections that resonate across time and culture. Ideas of keeping your chin up, soldiering on, all those aphorisms of hope and endurance are woven into Troy-Anthony Baylis’ Tomorrow(2009). 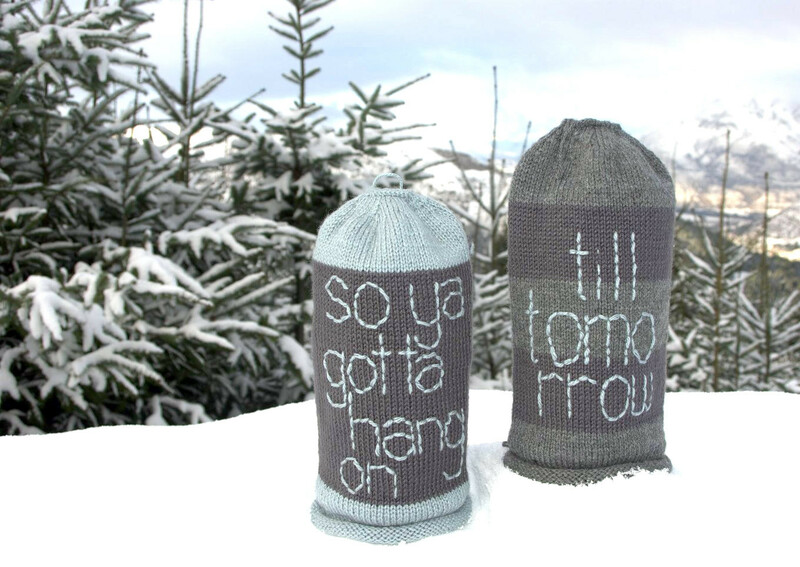 Looking like aberrant socks or an all purpose woolly warmer, these knitted tubes are sock striped in greys and marly greens and carefully embroidered with the chirpy lyrics of “Tomorrow”, “the sun’ll come up tomorrow, you can bet your bottom dollar…so you gotta hang on, til tomorrow”. In the care of the making, the homely forms and the naïve optimism of the lyrics Tomorrow is full of tenderness yet as an Indigenous artist Baylis has utilised these lyrics to have other particular and poignant meanings. 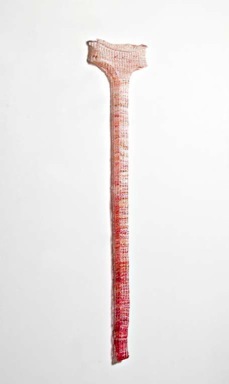 Suspended nearby, Kumiko Nakjima’s version of a Japanese room curtain (or noren) is rendered in colour infused glass canes in Stripes (2009). Hung as a pervious screen and hinting at liminal spaces it plays with the boundaries of inside and outside, of private and public, solid and liquid and provides a subtle, shimmering accompaniment to Tomorrow’soptimism. The literal motions of the everyday, of physically being in and moving through the world are harnessed in Sun Woong Bangs intricate Transit Series Bangle (2009). Constructed of silver filigree forms the bangle is wired to catch and store the energy produced by the movement between it and the wearer. The energy produced can (theoretically) run small electronic devices and this capture and translation of energy becomes an embodiment of the continuous rhythms and energies of the daily. 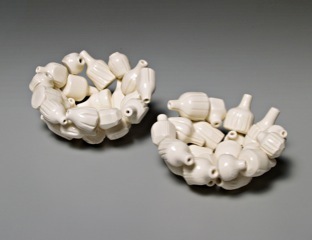 This cyclic energy is captured too, in Erin Lykos’ Bottle Bowls (2009) which are an attempt to reactive the tradition of recycling in Chinese culture, now derailed by Western consumer demand for objects formerly reused. Her bowls reproduce the medicine bottles previously recycled now collected, into useful bowls that keeps alive this transformative repurposing. As Stripes (2009) fluidly remakes the idea of the noren and questions the ritualistic organisation of spaces, Gilles Bettisons’ intricate, murrini glass pieces rework the traditions of this media, Lace (2008) is architectural in its forms with lacework and arches stacked like Venetian palace colonnades and Lace 2 (2008) resembles pressed sweets or delicate pastries set in glass evoking both the intimate and domestic and the grand and architectural while Textile 1 (2008) vividly invokes African cloths and dynamics in this free reconfiguring of a rigorous form. The stretched, slewed shapes of Irmina van Niele’s knitted undies, La Folie (2009) are slightly sinister, conforming rather to the laws of memory where things are not as they really were. While their lace patterns and knitted construction seems to place them as comforting domesticity, the scratchy plastic bags they’re made from suggests domestic discomfort rather than reassuring sentiment. As the surrealistic extended crotches of the underwear intimates an undomesticated sexual edge, Gerry Wedd’s ceramic canine table decoration Pack (2009) refers to a far darker colonial history than that reflected in the 19th century table decorations on which it’s based. While elaborate silver decorations such as Epergnes adorned with ferns, emus and kangaroos were popular Colonial gifts and presented an idyllic pastoral of the Colonies, Wedd’s savage pack races across the table’s clean white space to a kangaroo noosed and hung from a tree as more dogs feed on another already dead kangaroo behind it. The allusions to Australia’s history of violent conflict with its indigenous people are undeniable as Pack foregrounds this unquiet, living legacy. As the objects in Resonance roam freely across the ground of memory, ritual and custom, Zoe Jay Veness’ beautifully elegant jewellery captures time and space in the meticulous repetitive action of pleating paper in constructing her plicated, knotted and spiralling forms. Metres of precisely cut paper is concertina folded together with contrasting or harmonising colours lemon yellow, blues, mocha, cobalt and orange folded into one another over and over, their colours humming together. Her necklaces are constructed of a single long strand of pleated paper knotted repeatedly and invisibly joined, a continuous, everlasting strip. Her work is specifically structured around ideas of infinity and the endless forms and repetitive patterning of her pieces allude to the regularity of mathematical systems and space and time and make explicit the simplicity that underlies all complex systems. 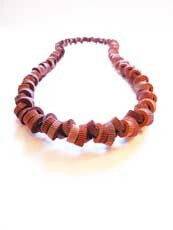 While the work is structured by the abstract and mathematical, these pieces exert a sensuous pull, they want to be worn. The richness of the colours butting up against each other, the controlled tension in the folded papers and the spiralling knots give these pieces a dynamic motion that echoes that of the body and would naturally cause them to move with the wearer. Time is caught in the making and speaks eloquently as the intellect and sensual come together in these works that resonate beyond the bounds of their form.